We all have a favorite pair of boots that we hope will last year after year, but the way you store them in your closet could force you to buy a new pair sooner than you’d like. Great boots are certainly an investment, and if you’re using boot clips to hang them year-round, it’s an investment not well spent. Boot clips can damage the overall quality of your boots, shortening their lifespan and forcing you to spend more money on a pair of boots you thought you’d never need to replace. Ditch the boot clips and store your boots properly with Boot Butler’s hanging boot rack that maintains the health of your boots and saves valuable closet space. We’ve all seen the hanging boot clips with sharp claws that dig into your boot’s material and inevitably leave a mark or crease that can’t be removed. If your boots are made of high-quality, expensive material like leather, exotic leather, or suede these marks and creases are an extremely pricey flaw that not only ruins the look and appearance of your boot, but their overall health and quality. Creases in leather or suede are extremely stubborn and essentially irreversible, and hanging your boots with boot clips day after day for an extended period of time, just worsens their negative effects. 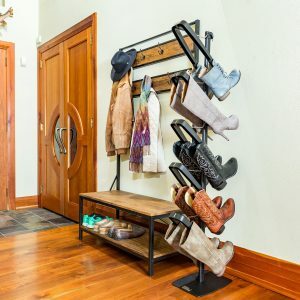 Boot Butler’s Hanging Boot Rack solves these boot storage problems. Our innovative design never leaves unwanted marks or creases. Unlike boot clips, Boot Butler hangs your boots without damaging them. Traditional hanging boot clips usually hang just one pair of boots per clip, which takes up valuable closet space where the remainder of your clothes and accessories would otherwise be hanging. When you own several pairs of boots, every inch of closet space is precious. Boot Butler Hanging Boot Rack stores up to five pairs of boots on one rack which takes up the equivalent closet space of just three dress pants. Store them vertically or horizontally. Face them in or out. Our hanging boot rack is easy to assemble and saves closet space so you can store your boots without sacrificing your entire wardrobe. If you try to avoid the damaging effects of boot clips by storing boots on your closet floor, chances are they’ll eventually end up in one large, messy pile. 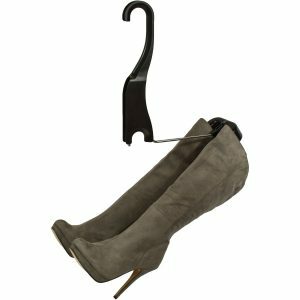 The Boot Butler Hanging Boot Rack tidies up your closet floor while maintaining the quality of your boots. It leaves no indentations, marks, or creases, and provides optimal organization for your closet and wardrobe. Boot Butler stores your boots in a way that makes them easy to see and find. No more messy piles on the bottom of your closet floor. Don’t damage your boots by storing them with boot clips. 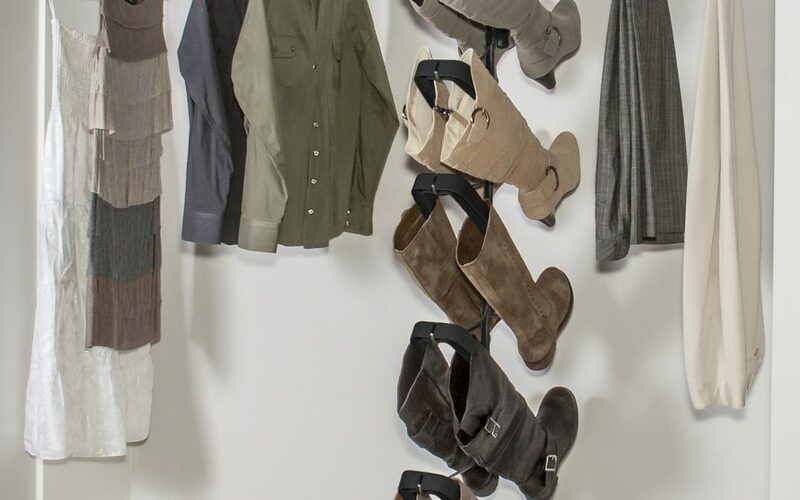 Save the money you’d have to spend on a new pair of boots and use Boot Butler Hanging Boot Rack to store your boots properly and organize your closet.